B.Sc. (Physics, 1st class honours), University College Dublin, 1962. PhD (Meteorology), Massachusetts Institute of Technology, 1969 [Thesis superviser: Jule G. Charney]. Prof. of Meteorology, Niels Bohr Institute, University of Copenhagen, 1995-2004. Senior Scientist and Branch Head, Lab. For Atmospheres, NASA Goddard Space Flight Center, Greenbelt, Maryland, 1987-1995. Irish Meteorological Service (now Met Éireann), 1963-1987. Positions held: Forecaster, Head of Research Division, Assistant Director. Member of the Climate Change and Environmental Sciences Committee, Royal Irish Academy, 2014-. 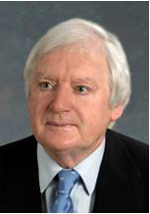 Chairman of the Climate Change Sciences Committee, Royal Irish Academy, 2009-2013. Chairman of the Scientific Advisory Committee for the RIA/EPA Tyndall Conference on the Greenhouse Effect and Global Warming, Dublin Castle, Sept. 28-30, 2011. Member of Panel of Experts, Office of the Chief Scientific Adviser to the Government of Ireland, 2009-2012. Member of Committee of Science & Technology, Royal Dublin Society, 2006-2014. Member of Advisory Board, Tellus, 1997-2004. Associate Editor, Quarterly Journal of the Royal Meteorological Society, 1997-2000. Chairman of WMO/CAS Working Group on Short and Medium Range Weather Prediction Research, 1982-90. Member of Committee on Meteorological Analysis, Prediction and Research, National Research Council, Washington, DC, 1988-90. Member of International Commission on Meteorology of the Upper Atmosphere, IAMAP, 1979-87. Chairman of the Scientific Advisory Committee, European Centre for Medium Range Weather Forecasts, 1978-81. Prof. Bates' current research interests are in the theory and modelling of the global climate. He is particularly interested in the mechanisms that keep the global climate stable at its current equilibrium and that determine its sensitivity to external forcing such as that due to CO2 increase. He is involved in the area of estimating climate sensitivity using global energy balance models and responses to surface temperature variations derived from satellite measurements.